Not one word was uttered on stage during Tuesday’s debut performance of STOMP at D.C.’s Warner Theatre. That’s when I realized STOMP is a communication tool. This unique blend of musical theatre stage presence combined with choreographed percussion, movement and physical comedy is more expressive than a singular conversation. What started as a street performance in the UK has grown into one of the biggest international performance sensations of the last two decades, selling out shows in over 350 cities and 36 countries. 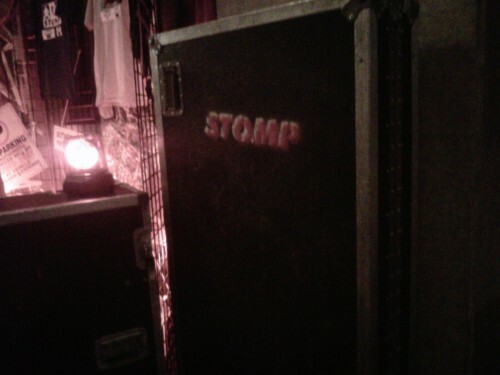 STOMP takes all of the fun stuff that annoyed your parents when you were a kid and makes it socially acceptable. Why is it socially acceptable? Because it’s art! For example, imagine a toddler or five-year-old wandering around the house while mommy and daddy are at work and the babysitting isn’t paying attention. It’s rather likely that little Johnny or Jane is going to attempt to dig through one of the garbage receptacles inside the family home and try to play with whatever they find. To an adult, trash is something we throw away. To a wide-eyed child, trash is intriguing and often-times a toy. To STOMP, trash (e.g. plastic bags and empty fountain soda cups with lids and straws) is a percussion instrument ready to be played. When asked what he loved most about participating in STOMP, dancer and choreographer Justin Myles of Maryland said the show wasn’t all about physical movement. 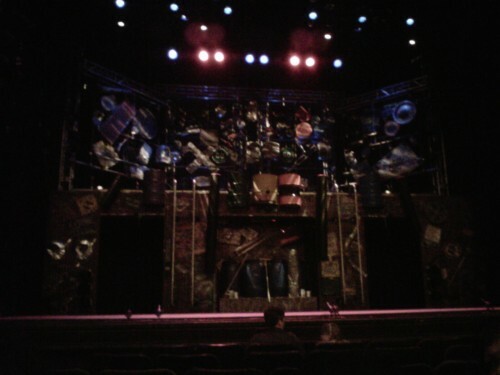 STOMP is just as much about the music as it is about the dance sequences. The eight performers on-stage for Tuesday night’s show demonstrated Myles’ thoughts. STOMP’s dance crew of six men and two women are a troupe of non-verbal, all-musical performance triple-threats. They can dance, they have a stage presence, and they’re of an orchestra caliber when it comes to their percussion performance skills. Warner Theatre almost felt too pretty to host a show that makes entertainment out of finding obscure objects, body parts included, to create a distinctive blend of sound that is all STOMP’s own. Only street performers, on occasion, come close to replicating what can be defined as a “street sound” genre. But even a street performer cannot do this team of well-trained performers justice. The best part is: They let the audience be a part of their on-stage conversation. In between playing with brooms, lids, plastic bins, six foot/six inch poles, 15 pounds of sand, four blocks of athlete’s chalk, 200 liters of water, 8 bananas, and 12 boxes of matches, Myles took a few moments throughout the evening to involve the audience by teaching them the occasional hand-clapped or foot-stomped rhythm. STOMP cast members have the opportunity of “playing off of each other” thanks to stage chemistry. All the audience gets to do is watch. Which, don’t get me wrong, watching is fun and all but STOMP looks more like a dance party you’d want to join instead of a stiff stage production with play bills and opera box seats to fill. Myles and his cast did exactly that, they involved the audience. A little physical comedy here, some rhythmic instruction from on-stage to the audience there … it’s all in a day’s work for the STOMP troupe. The lights resembled the same ones you would find a miner wearing while diving deep into the depths of the Earth. While I hate to disappoint any readers by saying, “No. The STOMP troupe did not pay homage to miners by re-creating a cave like stage scene.” Instead, they strapped on bungee cords and hung from a top a metal fence. While attached to the fence, the STOMP performers made music out of small metal tubes to create a chime sound, pots and pans to create a deeper chime/snare drum sound, fire extinguishers for rhythmic flourishes, and even car hub caps. It was a drum set (of sorts) attached to a wall/fence. I’d like to see the timpani player for the National Symphony Orchestra do what the STOMP cast did. I bet he couldn’t play timpani in rhythm with the rest of the orchestra while trying to do a mid-air back-flip in a harness on stage. What can be said of a talented cast? If they have chemistry then they’ll go far. This group most definitely did. Case and point – the “newspaper” scene. Don’t worry, though, no spoiler alert here. You’ll have to see the show to know what I mean but let me tell you one thing … Brazilian percussionist Marivaldo Dos Santos is one funny guy. If Saturday Night Live had this cast combined with Dos Santos’ goof ball sense of humor, who knows, they might get better ratings. STOMP is at the Warner Theatre through Sunday with shows Thursday and Friday at 8 p.m., Saturday at 5 p.m. and 9 p.m. and Sunday at 3 p.m. and 7 p.m. Tickets are still available at the Warner Theatre Box Office online at www.ticketmaster.com or www.livenation.com, or via phone at (800) 551-7328. For general information, call the Warner Theatre Box Office at (202) 783 – 4000 or visit www.warnertheatre.com. this show was sooooo good. i really enjoyed it. i love how the whole group comes together, yet at times, each has their own rhythm to make up the whole group rhythm. if i were raising children today, i wouldn’t have to spend much money for toys.